Kashmiri cuisine (Kashmiri: कॉशुर खयॊन / کأشُر کھٮ۪ن; Kashur khyon) is based on the ancient tradition of this area. The Rigveda mentions the meat eating traditions of this area. The ancient epic of Kashmir, namely the Nilmatapurana informs us that Kashmiris were heavy meat eaters. This habit persists in today's Kashmir. The most notable ingredient in today's Kashmir cuisine is mutton, of which there are over 30 varieties. Also to be noted are Balti curries, popular in theUnited Kingdom for their exotic tastes, that have spread from the Baltistan region of Pakistani Administered Kashmir. Harissa is, a unique Kashmiri dish prepared during winters across Kashmir. it is usually available in the morning hours . Harissa is somewhat hard to describe. It’s basically meat (mutton) cooked for a long time and then pulled off the bone. This very soft meat is then mixed with some uncooked rice, water, and spices. The mixture is stirred and stirred until it becomes mushy and smooth. To serve, hot oil is poured on top and then you scoop it up with fresh bread from the bakery. Kashmiris are heavy tea drinkers. The word "noon" in Kashmiri language means Salt. The most popular drink is a pinkish colored salted tea called "noon chai." it is made with green tea, milk, salt and bicarbonate of soda. The particular color of the tea is a result of its unique method of preparation and the addition of soda. The Kashmiri Pandits more commonly refer to this chai as "Sheer Chai." Noon Chai or Sheer Chai is a common breakfast tea in Kashmiri households and is taken with breads like bakerkhani brought fresh from the Sofi, or bakers. Often, this tea is served in a large Samovars. 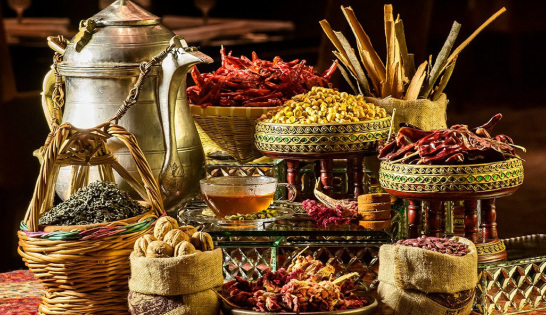 At marriage feasts, festivals, and religious places, it is customary to serve Kahwah, or Qahwah (originates from a 14th century Arab coffee, which, in turn, was named after an ancient beverage of the Sufis) - a green tea made with saffron, spices, and almonds or walnuts. Over 20 varieties of Kahwah are prepared in different households. Some people also put milk in kahwah (half milk + half kahwah). This chai is also known as "Maugal Chai" by some Kashmiri Pandits from the smaller villages of Kashmir.